Moriches, NY - November 20th, 2014 - Students enrolled in Ms. 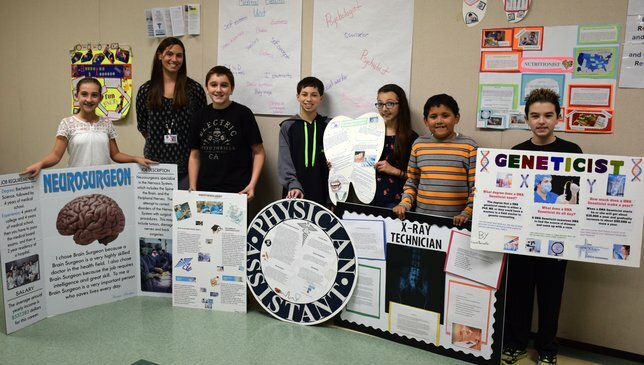 Crystal Vetrano’s Health Education classes at William Floyd Middle School recently completed an assignment where they had to research jobs in the health and wellness field that they might be interested in pursuing as future careers. Some of the career and job occupations that the students chose to delve into included anesthesiologist, dental hygienist, geneticist, neurosurgeon, physician’s assistant, x-ray technician and more. Pictured left to right are: Karisa Pluchino, Ms. Crystal Vetrano, George Laopodis, Ryan DiGiacomo, Olivia Iodice, Alberto Montalvo and Louis Parrinello. Subject: LongIsland.com - Your Name sent you Article details of "William Floyd Middle School Students Research Careers in Health & Wellness"